Are Cyclical Stocks Trying to Tell Us Something About the Direction of the Dollar? Over the past decade, global cyclical stocks and the dollar have tended to move in inverse directions. Whenever the dollar weakens, like in the first half of 2009 and the second half of 2010, cyclical stocks have tended to outperform the broader market. Cyclical stocks have been outperforming since 7/7/16 and that outperformance really accelerated after the US election. What is unique, at least unique for the past decade, is that the recent outperformance for cyclicals has coincided with a stronger dollar. Now, there are (at least) two possible explanations for this short-term change. 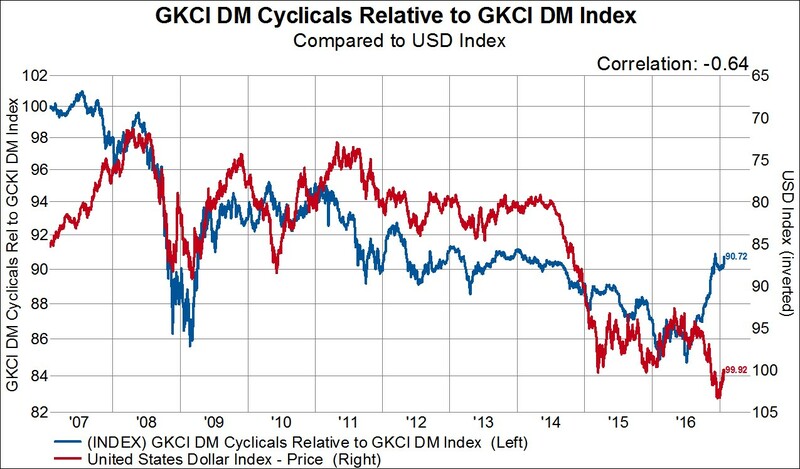 First, perhaps the market is moving into a different phase where the dollar and the performance of cyclicals move higher in tandem. This would probably be the start of a multi-year trend change if this does indeed play out. The second option is that the last couple of months have been an anomaly and that the negative relationship between the two series will reassert itself. Early evidence from the market is more supportive of the later option. 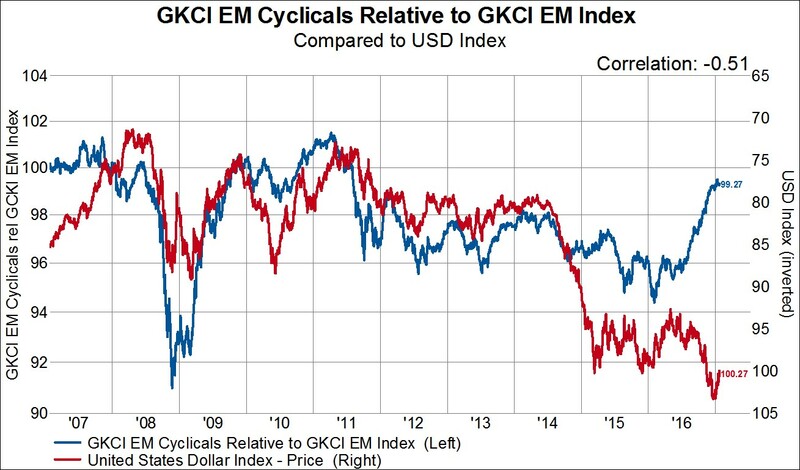 Cyclical stocks are basically back to multi-year relative performance highs in the developed market and are at 4+ year relative highs in the emerging market. Meanwhile, the shine has started to come off of the stronger dollar as the USD Index is down over 3% since making a high on 12/20/16. It’s important to place these recent market moves in the context of investor positioning as well. The ‘smart’ money, commercial traders, are as short the dollar as they have been at any point in the last decade outside of early 2015. 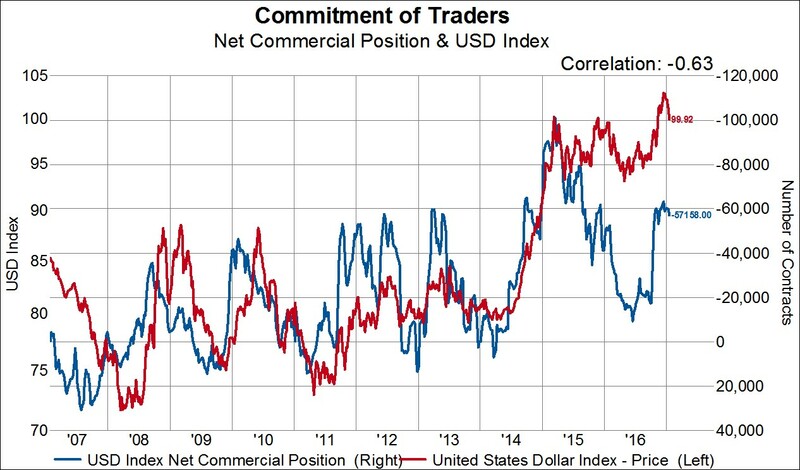 As the third chart below illustrates, commercial traders tend to call turning points in the USD Index fairly accurately. They certainly nailed the 2009 and 2010 sell off in the dollar.